I’ve been lucky enough to work in Uganda over the last couple of years and this has given me the fantastic opportunity to photograph some of Uganda’s amazing wildlife. I certainly don’t profess to be any sort of bird or wildlife expert, far from it in fact, and before working in East Africa I could hardly tell one bird species from another. However, when it comes to birds of prey, even they generally grab the attention of many a non-ornithologist. As they generally say, the best photographs require a high degree of luck and this one was no exception. A friend and I had gone for a drive within the Kabyoya Game Reserve, a small region around Kaiso on the eastern shore of Lake Albert in Albertine Rift valley of north west Uganda. We were not far from the Lake Albert Safari Lodge and much of the surrounding high savannah grass had been burnt to the ground in the annual burnings. This is a good time for the raptors, as their normally hidden prey is revealed and less well camouflaged against the blackish brown, scorched earth and stubble. Prey is on the move too, trying to escape the encroaching fire. 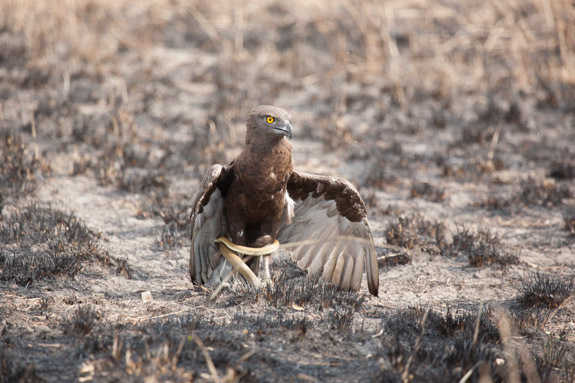 The Brown Snake Eagle was spotted perched upon a tree top and we pulled over to take some photos. My fellow photographer sported a Pentax with 50-500mm Sigma zoom lens, me with my trusty Canon 5D and my EF 100-400mm, f4.5-5.6 Zoom. Contrary to most wildlife blogs we don’t have time for tripods and hours of waiting, with just an hour or two to catch what we can. Everything is shot hand-held from the vehicle window. Image stabilisation (IS) is invaluable. I only managed to fire off a couple of frames (being on the passenger side) before the eagle took flight. Another disappointment. We drove on, just passed the tree, when suddenly we were aware of a faint flash of something light coloured off to the drivers side, the next thing I hear is “It’s got a snake!“. 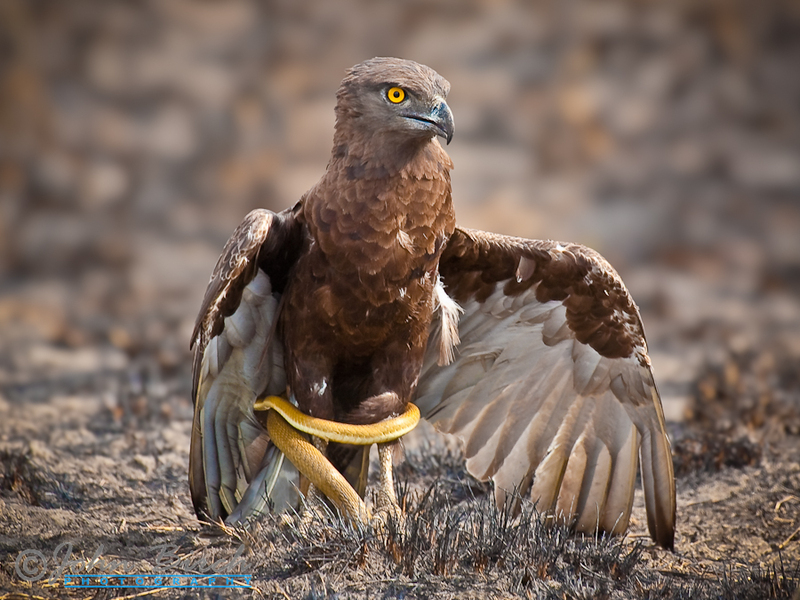 The eagle had swooped down the other side of the tree and caught a cobra; the flash being the underbelly of the snake as it writhed around the Eagles talons, one talon firmly fixed upon the cobras head. We pulled up as close as we dare and started shooting as fast as possible. I had to shoot across the driver so there was no time for even thinking about composition, just grab the photo. 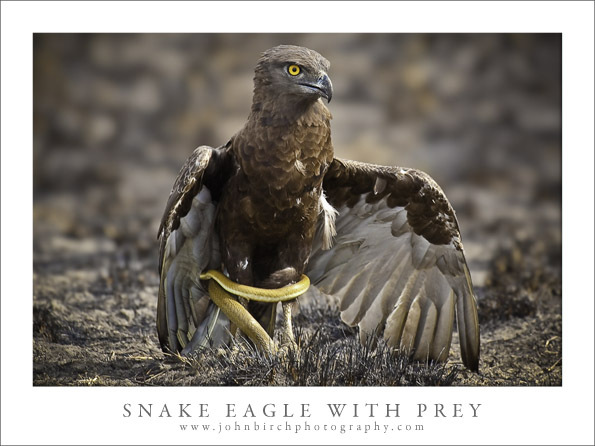 I managed to bag 18 frames during which the eagle bit off end of the snakes tail, cloaked it’s prey, then flew off back to the top of tree grasping the wriggling cobra. I kept my camera set on AV (aperture priority), aperture wide open at f/5.6, with only the centre focus point enabled. I tried to focus on the eye and quickly re-frame. It usually works .. some of the time. I was pretty sure I’d bagged a decent shot but joy turned to bitter disappointed when I viewed the frames in Lightroom later on. A long blade of dry, parched, unburned grass, arched over and blurred, appeared in the foreground of every frame, passing right across the eagle. Of course I didn’t even notice that when shooting, my eyes and lens just focused upon the eagle. The burnt stubble in the background was almost as dark and a similar colour to the bird, so the frames lacked contrast. Several frames were too blurred and beyond redemption and none of the snake parts were in sharp focus. They seemed like a lost cause. Several months later however, I took another look at the images. They really they weren’t that bad. Perhaps I’d been too critical at the time. It was OK that the snake wasn’t that sharp, as long as the eagle was. Now I’m not usually one for spending time attempting photo-manipulation in Photoshop; I’m not particularly great at it, and more often than not it never quite come out looking right. However, this was one time to try. I patiently cloned out the offending blade of grass, together with a distracting leaf in the foreground, adjusted the contrast, clarity, vibrance and saturation to make the bird’s colours stand out as much as I could against the brown background. To finish off I applied a gradual blur to the background to accentuate the lens Bokeh, sharpened the eagle and cropped the frame. This did the trick. Now I had an exciting wildlife photograph, one that I was more than pleased with.